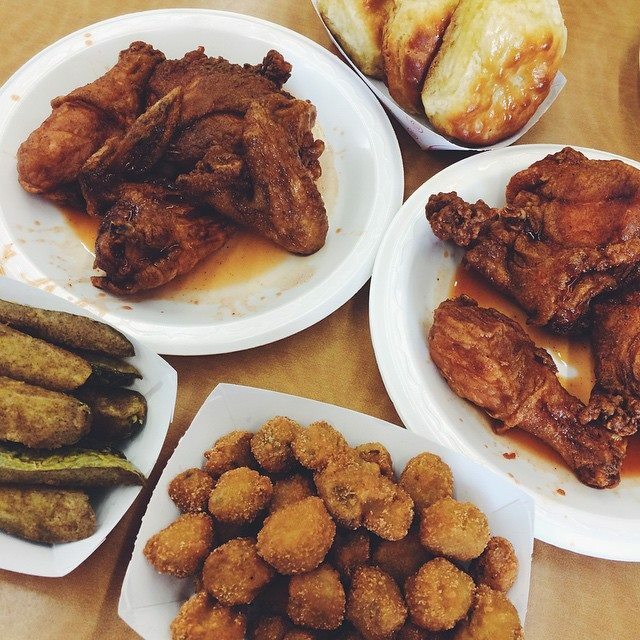 Uncle lou's fried chicken was established april 4, 2001. Uncle Lou's has been featured several times on national television. Including appearances on The Food Network's Diners Drive Ins & Dives and Best Thing I Ever Ate. Also on Southern Livings Off The Eaten Path. Uncle Lou's has become a mainstay in Memphis, and a hot spot for travelers the world over, having customers from over 60 countries, and 6 continents. “They came in January, I got to meet Guy Fieri, and we had a ball shooting the show. It was so funny because you know, he’s got a lot of one-liners and I do too, so the producer was like, ‘Come on, guys, cut it out.’ He’d say something, I would respond, and we’d be laughing. Of course it would be on camera, so we’d have to shoot it over again.” The show aired on Diners, Drive-Ins, and Dives on August 4, 2008. “Before the show, we were on the brink of going out of business, seriously. We didn’t have a big enough customer base. I knew we had a good product and good service, but the masses didn’t know about us. So when I found out we were going to be featured on the Food Network, I called my creditors and said, ‘You got two options. If this thing takes off, you’ll get paid. If not, I’ll be out of business and have to file bankruptcy. So I guess you guys might want to wait.’ That’s what happened, and it worked out for us. After the show, things took off, and we’ve been here for 15 years now. Uncle Lou’s Fried Chicken was established April 4, 2001. Since then, we have won the “Best New Food Item” at the 2001 Mid-South Fair, for our Honey-Dipped Chicken, “Best Overall Food” at the Mid-South Fair, made the cover of B. Visible Magazine for the Monster Burger. Uncle Lou’s Fried Chicken is also served throughout Liberty Bowl Stadium, including all University of Memphis home football games. A special thanks from Uncle Lou and his staff. You had over 900 restaurants in the Memphis area to choose from and you chose Uncle Lou’s. We are referred to as a restaurant destination and a service station because Quality Products and Customer Service are priority ONE. Uncle Lou’s Fried Chicken recipe is an ‘Original’ family recipe started by Uncle Lou’s Great Grandmother and was passed on to Uncle Lou by his Mom. Please use this form to voice any questions or concerns. Do not use this form for sales pitches, or spam. It will be ignored.